Green Preserved Moss is natural and biodegradable. Easy to take care of - no need to plant. Creates an interesting landscape. It has beautiful color that lasts longer, is more pliable and clear to use. Easy to cut with scissors. 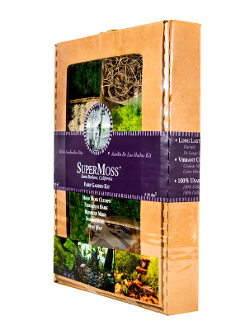 The moss is great to use for terrariums, potted plants, covering orchids, dish gardens, floral arrangements, wreath, topiaries, model train scenes and more. Package contains 108.5 cubic inches (1/32 liters) of moss. USA Product.